Designed for especially for women. Low profile, moldable aluminum frame with FourcePoint hinges. Is the Female Fource Brace right for me? For female athletes returning to their sport after an ACL injury. Try our Brace Advisor for personalized product recommendations to meet your needs! ACL Brace Specifically Designed for Women! Females are 2-10 times more likely to sustain an ACL tear than males. The DonJoy Female Fource by DJO addresses biomechanical factors that have been implicated in the high incidence of anterior cruciate ligament (ACL) tears in females. The Female Fource incorporates DonJoy Orthopedics' (DJO) FourcePoint hinge technology, which has been clinically demonstrated to increase knee flexion angles1, 2, limiting the time the knee spends in at-risk positions during activity; therefore, providing females the protection they need. The Female Fource is a functional knee brace that comes with a custom graphics sticker sheet to allow patients to personalize their braces to their own liking. DonJoy's (DJO) OTS Female Fource is a lightweight, low profile functional knee brace designed specifically for females and is perfect for the active female returning to sport or the general female population returning to activities of daily living where an OTS brace is required. Need new straps or pads? Shop DonJoy Female Fource replacement parts for full kits and individual condyle pads, undersleeves, straps and more. 1. Lin CH, Liu H, Garrett WE, Yu B. Effects of Knee Extension Constraint Brace on Selected Lower Extremity Motion Patterns During a Stop-Jump Task. Journal of Applied Biomechanics.2008;4:158-165. 2. Stanley C, Creighton R, Gross M, Garrett W, Yu B. Effects of a Knee Extension Constraint Brace on Lower Extremity Movements after ACL Reconstruction. Clinical Orthopaedics and Related Research. 2011; 469(6):1774-1780. I am thinking of buying either the Female Fource or the Full Force, for both my right and left knee. I had ACL reconstructions about 10 years ago, and want to return to sports without fear of reinjury. What are the differences between the Female Fource and FullForce? Do the braces obstruct each other if you wear them on both legs? Thank you for contacting Better Braces. The difference between the Female Fource and the Fullforce braces are the female fource only comes in a short calf option, and cosmetically the female force has a more femanine blue hinge with flowers on the calf as well as additional decal stickers that come with the brace. Both braces feature a swooping thigh that makes it easier to wear braces on both legs without obstructing each other. I bought this knee brace by mistake but would like to know if it would help my knee. I have arthritis and trying to prolong a knee replacement. I also have condomalsa . I'm very active in Zumba and walking. I tore my ACL 3 weeks ago, while skiing. I have had an MRI and have decided do to some work related conflicts to wait on surgery for a little while. I am a hair stylist and a pure barre fitness instructor. I have been working out with a basic brace from the dr. Office since I injured my knee. What brace would you recommend? The Full Force Ligament brace will provide you with support to the knee and the Fourcepoint hinge will help to preven any further injury. It is light wieght and low profile. I am looking for the best brace for myself. I was a competitive soccer player and I tore my ACL and Meniscus in my right leg which had a failed autograft reconstructions so opted for a Tibial Tendon allograft. Early March is my 7 month mark. I still play high level Soccer and would like to return and I play softball. I had a successful autograft ACL reconstruction and both meniscal repair on my left leg 9 years ago. I am also a fitness bikini competitor and would like a great solution for some knee pain I experience from Chondromalaysia in my right knee. Also, the best affordable option. Thank you so much for the help! For the leg that had the recent ACL Reconstruction I would suggest the DonJoy Arrmor with the fourcepoint hinge. This brace is going to be the best support for your knee and will help to prevent further injury. The leg that has the chondromalacia should be in the don Joy Reaction Web knee brace. this brace will help with that anterior knee pain you are feeling. I am 52 years old, weigh 140. I tore my ACL and partially tore my MCL skiing three weeks ago. I'll have surgery sometime this coming year. Before then, I am committed to performing in a community theater show that requires some dancing. I need a brace that will stay put, fit under business wear, and give me the support to keep me going for a good six months. And of course I want to ski! Which would be the best choice? The Don Joy Armor knee brace with the Fourcepoint hinge is our "off the shelf" option for someone who would like to ski. The hinge will protect for re-tear of the ACL. If my measurement is in between Large and Medium (21”, 15”, 15"), which one should I get? This brace has the short calf so it can be worn with a ski boot. It does not come with extension stops but the brace does have a 10 degree extension stop installed. I had an ACL graft (replacement) about 4 years ago and got a rigid brace for stability for playing sports. I recently had a motorcycle accident (2 weeks ago now) where my knee ended up between the bike and the road. MRI showed bruising but no tears to the ligaments ACL or MCL. I am having some issues with instability. The rigid brace is great when playing sports, but clunky to wear all the time. Is there a brace you would suggest that would give me some lateral stability without being too much? I am female, 5'8, 215 pds; measuring for different sizes for thigh than for calf (Knee Center 17.5, Thigh 28, calf 20). What is your recommendation for size - xxl or xl? When taking measurements, it is recommended that you are standing up shoulder width apart, legs slightly bent and muscles contracted. If you were based on the measurements you have given me, you would fit in the in the XL since the knee center takes precedence over the thigh and calf measurements. I have torn my ACL twice while wearing this brace, and I would like to know if I could receive a refund. I did not use the same brace. I ordered a new one and I still tore my ACL again. This was a complete waste of my money, and I am very disappointed that I trusted this brace. I recently have had my second ACL reconstruction surgery on my right knee in the past 13 months. I was wondering if height played a factor in the size of the knee brace? I am a 5'11" female. My daughter tore her ACL and meniscus Nov 2013 and had reconstructive surgery(hamstring graft) to repair both. She has now returned to Power Tumbling/Cheerleading and she runs track as well. Which brace would you recommend to help with the shock absorbency and protection of her ACL going forward? I think the Female Force or the Full Force Ligament knee brace would be a good choice for your daughter. Both will protect the ACL from re-injury, with our clinically proven fource point hinge and four points of strapping system. The difference between the two is that the Female force is a bit of an older brace so the hinge is our older version of the fource point hinge, which is not as low profile as the Full Force. The Female Force also comes with decals to stick on the frame of the brace. My daughter has loose ligaments, and her knee tends to dislocate during physical activities, and tends to get injured a lot. She needs a brace that will allow her to play her sports (soccer, lacrosse, and track) at full effect. Is this brace a good fit for her? I'm in my 50's and have a very old Don Joy that I use to play tennis. (Competitive) I've had 3 surgery's. The last being over 20 years ago. This is preventive and security. Recently moved so don't have an orthopedic to consult . I just want to replace the brace I have. Basically no medial meniscus and compromised ACL issues. Will this brace work for me? If not, what do you recommend? It says it has a moldable frame. Do I just bend the frame to create a better fit or what is the best way to do this? I need it to be a little tighter around the calf because it rubs a lot. I have a lcl grade 2 and a meniscus tear with instability of my ACL would this brace work? I play a lot of sports and kickboxer so I have bigger legs would this work or should I have a custom made one like I did years ago for my ACL? The female force will work for your knee with the injuries you have. If you have a older Custom Defiance for this knee you can use that brace or get it re-made if you need to to be re sized. I have a 4 year old ACL injury. I haven't had surgery. I'd like to return to soccer, but still experience occasional lateral instability. I will also use the brace for snowboarding. I'm a 5' 4" female. Which brace do you recommend? A year ago I injured my knee playing volleyball and got an MRI and was told I have multiple tiny tears to my ACL and MCL. They said that it was minor enough to not have to do surgery immediately but they would tear and surgery would be needed. is this a brace that would benefit/help me? If not which knee brace would help? Thank you! 3 weeks ago I was bucked off a horse. Had an MRI done a week ago and came back saying I have a torn ACL & MCL. My doctor wants me to wear a brace for 3-4 weeks than 6 weeks PT. My MCL is a 2 degree, and don't really know how bad my ACL is. Do you tink this brace will be OK for me? I am a 17 year old basketball player, I recently had surgery on some cartilage I had chipped and the doctor discovered I was not born with an ACL. I am 5'7 and I weight 114 lbs. Which knee brace is the best for me? I am a 16 year old girl. It has been about a year since my ACL reconstruction after a soccer injury. I want to return to playing soccer this year. My knee is mostly recovered, I just want extra support to decrease the risk of re-injuring my knee. What are my best options for braces? My daughter is 4 weeks after ACL reconstruction (with hamstring autograph) after soccer injury. She is 5'1'' about 105lbs. Is this brace the most suitable for her recovery and for using when she returns back to playing soccer? Or which ither brace? The brace have to fit over the shin guards. I'm about 3 weeks post op ACL surgery and I want to go to the beach. I'm in the female fource point brace. Can I wear this brace to the beach? Also, I was interested in extra straps and pads. How can I tell what size to order for my brace? What brace do you recommend for a 14yr old, still growing, female, post ACL Reconstruction to return to competitive tumbling and trampoline ? She is about 5'4" and 115 lb now. What is the difference between the custom Female Fource and the non custom version ? Either of those braces would be sufficient for the 14 yr old. The difference is that the custom is measured only for one person, has a lifetime warranty on the frame and hinges but does have minimum thigh and calf circumferences that we can make the brace for. The Off The Shefl version is already made and comes in 7 sizes, so an XS might fit someone who doesn't meet the minimum size for the custom, the warranty is for 1 year on the frame and hinges. I tore the ACL, MCL and meniscus of the right knee back in 2001 which warranted surgery. I was put in a knee brace back then, but have not worn one in over 10 years. I am now ballroom dancing and find I am having difficulty executing some of the dance positions with my right knee. I am also very active with softball/tennis, workout and ride motorcycles. I am a female, 5'5" and 130lbs. What is the best recommended brace for me? Either the Female Fource or the Fourcepoint knee braces will work fine for what you would like to do in them. They both have our clinically proven technology to help reduce re-tear of the ACL by 50%. They are light and low profile. Can you give better instructions on how to adjust the hinges? What the little pieces are for and how to place those in if needed? Thanks. I tore my ACL and have already done restorative surgery, but I am handball athlete, a sport that have high physical contact. I wonder if this brace is ideal for me because I'm not sure if it can hurt other players. I am 5 '3 "118lbs. The Female Fource ACL would be a good brace for you. It is recommended that someone under 5'4" so with a brace that has short calf, which the Female Fource does. 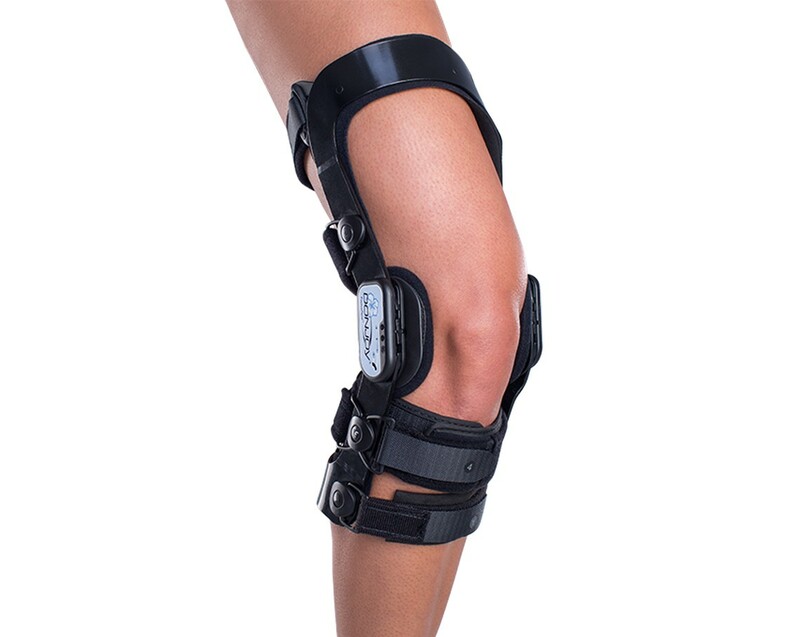 This brace also has the FourcePoint hinge which will give added protection to your ACL. The FourcePoint hinge is designed to dampen the 35 degrees of extension and keep the amount of time the ACL is in at an "at-risk" position. With this brace (as with all of our rigid braces) you have the option of a sports cover which would go over your brace and offer padding around the frame and hinges, this is often used in contact sports. Thank you for contacting DJO. The knee pad should fit well over the brace. You will have exposed metal on the frame above and below the pad. Depending on the rules of your league, that may be something to consider. The fullForce is a great brace for you ACL/MCL injuries. The hinge up rights will provide stability to the MCL and LCL. The strapping sequence along with the frame (out 4-points of leverage) will offer stability to the ACL. The FourcePoint hinges are designed to react during leg extension and offer an increasing resistance in the last 35 degrees of extension, in order to reduce extension shock and increase posterior tibial loads. The hinge has three adjustment settings to vary the amount of resistance to meet the specification of the physician's protocols and the patient's comfort. Because of you are involved in a contact sport you may want to look into the Armor with the FourcePoint Hinge. The Armor is our most durable brace and specifically recommended for contact sports. It is thicker than any other brace we make and therefore a stronger frame. Will insurance plans pick up any of the cost for any of the more expensive knee braces? It is common for insurance companies to cover some or all of the cost of a knee brace (depending on your plan and coverage). However, it is required that your doctor prescribe you with a knee brace. You can also contact our insurance division at 800.548.3370 for more questions pertaining to insurance coverage. I measure between two sizes! What should I do? Not knowing your measurements, it would be recommended you go with the Knee Center measurement. That is the priority area for the fit and comfort. You can call Product Support at 800.553.6019 for assistance in helping you choose the correct brace for your situation. Thank you for contacting DJO. I am a 51 y.o. female who had surgery last week for a medial meniscal tear and ACL probing and "trimming". I had ACL repair 26 years ago and it appears the ACL is now "deficient" as my Dr. quoted. It is there but non-functional. He doesn't want to do a revision d/t lengthy rehab and my age. I primarily do cardio/ weights at the Y, walk, and occasionally golf. I am 5'11'. What brace would you recommend for this scenario? I like the low-profile type if possible. I recommend the Full-Fource, its the lightest ACL brace we currently have, and it features our New Fourcepoint Hinge. Or if you would also like a OA Hinge that offloads your damaged meniscus we have the OA FullFource, of Nano. The OA Braces off load the meniscus by opening up the joint space, in your particular case the lateral hinge will apply pressure on the lateral side of knee to open up the joint space and take the pressure off the medial knee. I have an ACL rupture. I don't want to do surgery yet. I am doing physiotherapy to straten my knee. Is this brace the best choice for me? I am 5'8" 130 lbs. I recommend the FullFource, this is an ACL Brace, with a Fource-Point Hinge. This type of hinge provides support to the ACL, by dampening the last 25 degree's of extension. It says this brace is moldable. What does that mean? How should I go about doing this? A year ago I tore my ACL, shredded my meniscus and suffered a high grade 3 sprain to my MCL. I had surgery and am now returning to Judo and Jiu-Jitsu. I'm a small woman (5' 0" , 113 lbs), and my 10 years of lifting weights have given me pretty big thighs (19"). Should I get this brace or the 4titude? I recommend the 4titude. it's our shortest brace. It is available in a short thigh, and short calf. It has a malleable thigh cuff, if you needed to adjust it to accomodate for your thigh. If you would like to speak to a Product Specialist please contact 1-888-405-3251. Is it also for MCL? Yes, this brace will also support the MCL. Hi, how many sticker sheets are there and what do they look like? The brace comes with one sticker sheet. They are white hibiscus flowers to be placed on the thigh bar (optional). Hi, I am 5' 2" and was wondering if this knee brace can also be used while skiing? These say they have increased medial thigh clearance. Is the clearance increased enough to wear two together? Yes you could wear two braces at once since the medial thigh portion is open. is it okay to use this brace to swim in? You'll want to rinse the brace in fresh water after immersion. Also you may want to purchase a tube of DRY Teflon Lube, adding a drop in the back of the hinge after immersion. This step will keep the hinge functioning properly. We purchased this brace for our daughter, who plays AAA women's hockey, after she tore her ACL. This brace has proven to be very light and flexible, providing adequate support for her knee for hard stops and pivoting. It fits well under her hockey equipment and light enough that she forgets she is even wearing it. We tried numerous other braces, but this one is by far the best. We would recommend this brace for any woman who plays a highly competitive sport. Suffered a dislocation injury to my R knee during a long jump (ouch) resulting in a ruptured ACL, torn MCL, torn meniscus and fracture of tibial plateau. Unable to have repairative surgery to ACL as recommended by my ortho surgeon due to a family member needing emergent supportive cancer care during the period of time following my own injury, so opted for healing time and PT to maintain the joint and increase leg strength as able instead. Doing so well that I have considered not pursuing the procedure at all at this point., but I am 57 and not a competitive athlete so this I have figured in to my decisions. I wear my brace during activities of increased stress/re-injury risk such as riding my motorcycle or walking with a 50 lb backpack on uneven surfaces. I am 2.5 months post injury presently, and do notice some minor instability in my knee side to side without an intact ACL. Pros: Surprisingly light and comfortable. Can be set to several different tolerances of degree of joint flexion as the injury requires. Forget that I am wearing it. Comes with several different pad options for the contact points, which was very helpful to have. My torn meniscus causes some tenderness to pressure in the inner knee area (at times) and I was able to swap out the more rigid countoured pad that the brace came with (and was recommended for my injury) with a softer more comfortable one. This knee brace has helped me have more confidence after my knee surgery, it hardly restricts me and i forget that it is even there.